Head coach John Dalziel has once again been able to select a Scotland 7s squad entirely of core players – including a familiar three from his former club, Melrose – for this weekend’s HSBC World Rugby Sevens Series tournament in Hamilton, New Zealand. 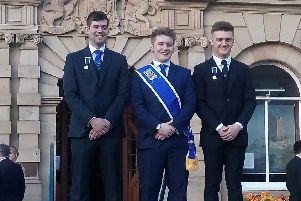 The Greenyards trio of Ross McCann, Sam Pecqueur and Nyall Godsmark remain in the squad which competed in the opening two rounds, where Scotland reached consecutive quarter-finals. Scotland have been drawn in Pool C with France, Kenya and reigning champions South Africa in New Zealand. Dalziel said: “Training has gone well and we have an almost full squad to pick from, which is great credit to our support staff and the conditioning of the players. “We are starting to get a settled group with some key relationships starting to form and hope consistency in selection will drive more consistency in our delivery. “We are also building real competition for places and our players are now catching the eye of the pro team coaches. It’s testament to the programme that we can select this this group of players and also support the pro sides during international windows. “All three teams in our pool possess major threats across the board but are all very different in their tactical approach. Saturday, January 26 – Scotland 7s v France 7s (9pm). Sunday, January 27 – Scotland 7s v Kenya 7s (0.48am), Scotland 7s v South Africa 7s (5.22am).